Designed to accompany the Rupert's Tales books (links below), this is a wonderful activity book! 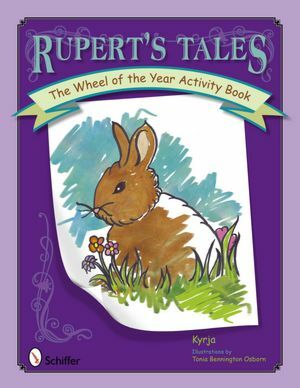 Pages to color, puzzles to solve, and quirky games allow children of all ages to join Rupert and his friends as he learns about the eight sabbats of the wheel of the year. Sadly, the pages are all in black and white, and Tonia Bennington Osborn's illustrations are less charming without color. But that is my only complaint, and it a very (VERY) small one. A good friend of my has four children and is my 'tester' for children's books. He says "Thank you thank you thank you for sharing these with us. We struggle with how to tell the stories and share the meaning of our year with our children in ways that won't get them into trouble with outsiders. "That is the nature of nature; there isn't anything wrong" is a powerful statement we are proud to teach them."